Type 2 diabetes is a chronic disease characterized by the inability to control blood glucose levels. Therapies that prevent degradation of glucagon-like peptide-1 (GLP-1) improve insulin secretion; however, these treatments do not mimic physiological GLP-1 fluctuations and can result in hypoglycemia. Intestinal L cells are a source for secreted GLP-1; therefore, Natalia Peterson and colleagues at the Hubrecht Institute of the Royal Netherlands Academy of Arts and Sciences evaluated the use of a gamma-secretase-Notch inhibitor dibenzazepine (DBZ) to increase incretin-producing L cells as an alternative approach to enhance insulin secretion and improve glucose tolerance. In organoid cultures and mice fed a high fat diet, DBZ treatment increased expression of genes associated with L cell development, augmented intestinal L cell quantities, and led to an increase in secretory goblet cells. Furthermore, DBZ-induced L cell enrichment promoted GLP-1 production, resulting in an improved insulin response and glucose tolerance in a mouse model of type 2 diabetes. Blockade of GLP-1 with a receptor antagonist attenuated the beneficial effects of DBZ treatment. Together, these results suggest that L cell enrichment in the intestinal epithelium may be a beneficial therapeutic approach for controlling type 2 diabetes. 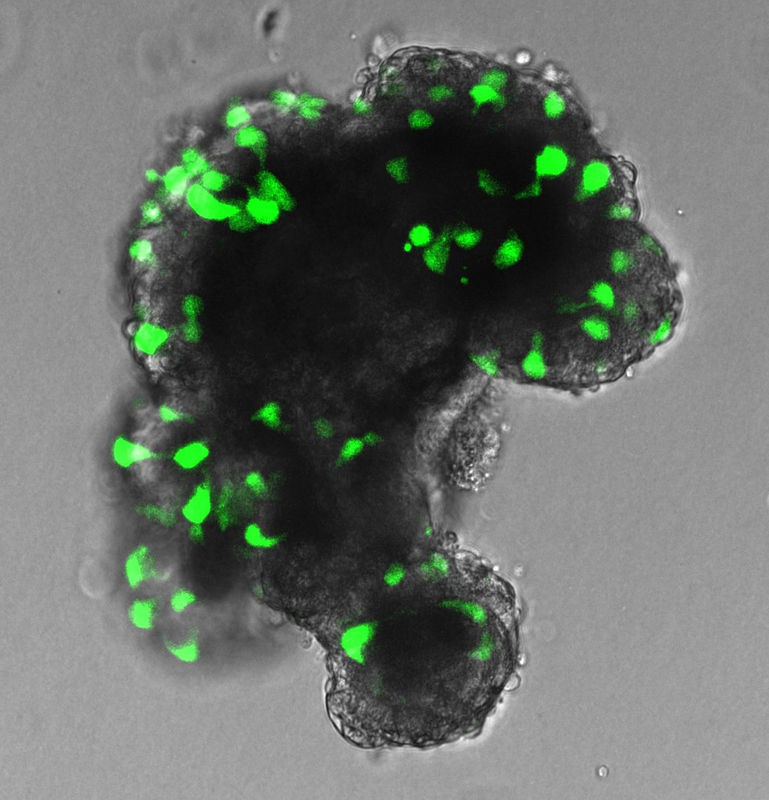 The accompanying image of a DBZ-treated murine intestinal organoid culture from Glu-Venous mice shows a dramatic increase in L cells (green).